Google's Motorola unit has launched a relatively low-cost smartphone that includes features more commonly found in higher-priced models. Motorola's Moto X brightened up our lives with its color options, its decent lineup of specs, and its reasonable price tag. As a US-only phone however, it was a bit of a letdown for those of us living outside of America. Motorola's new Moto G brings a near identical design, a host of colors, a 720p 4.5-inch display, and a ludicrously cheap price tag. 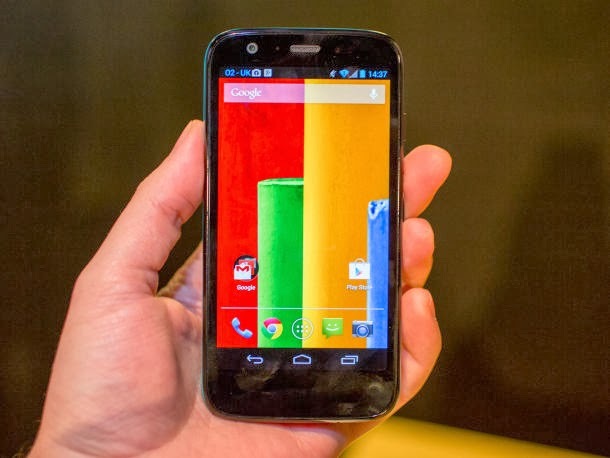 Moto G smartphone will launch in "early-January 2014". 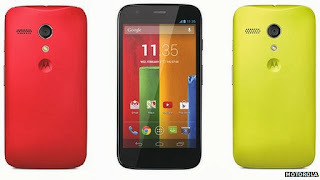 Other markets to get the Motorola Moto G in the same period include the US, the Middle East and more countries in Asia. Further, Motorola announced that Moto G will also be available in a dual-SIM variant, for selective markets. It will start at $179 for the 8GB model or $199 for 16GB of storage. In the UK, the Moto G will be available on pay-as-you-go at O2 from £130, and elsewhere for around £135. It will be available from today in Brazil and parts of Europe, including the UK, and will hit the US and the wider world in January. It features a 4.5-inch HD display with a resolution of 720x1280 pixels and boasts a pixel density of 329ppi. The Moto G is powered by a 1.2GHz quad-core Qualcomm Snapdragon 400 processor along with 1GB of RAM. On the camera front, the Moto G sports a 5-megapixel rear camera along with an LED flash and also includes a 1.3-megapixel front-facing camera. The rear camera supports HD video recording. The Motorola Moto G also features water-resistant coating. The Moto G packs a 1950mAh battery, which Motorola claims can deliver up to 30 percent more battery life than the Apple iPhone 5s. The Moto G also features removable curved back and the company also announced a bunch of accessories including coloured removable shells, flip-cover and some music accessories like JBL wireless speakers for the device. Motorola Moto G also comes with some company's proprietary features like Motorola Assist and Motorola Migrate. The company is also offering 65GB of free online Google Drive storage will the Moto G.